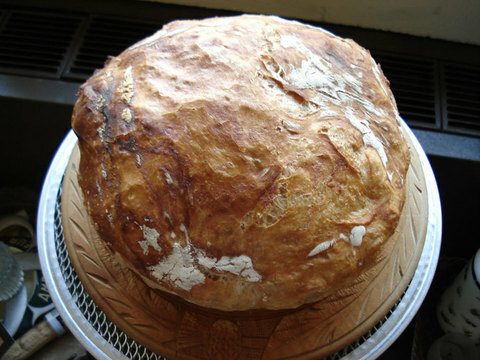 Bread for ElliottMy friend Lisa Yockelson is always telling me how lucky my husband is that I cook dinner every night. We're both lucky because it's a wonderful way to live. It's healthy and nurturing on many levels. And it takes no longer than it would to go out, sit in a restaurant, wait for the food to come, and then get home. When we were married, almost 31 years ago, Elliott had been widowed for 9 years and was very independent as a sole parent and provider. In all these years he has never asked me to do so much as sew a button on a shirt and I went to the Fashion Institute of Technology! So it was very pleasing that he put in a request for me to leave him two breads in the freezer for the two weeks that I'll be away in France/Germany. I asked him which ones he would like and here is the result of his request--already sliced and sitting in the freezer. 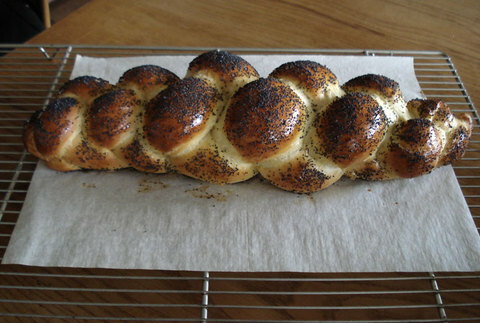 The famous No Kneader and the challah. I'm not leaving 'til Monday but he's already started on the challah. (Believe me I've been tempted to steal a piece or two and managed to restrict myself to one little one under the pretext that I had to see exactly how it came out. One of the most perfect ones I've ever made!) It's becoming increasingly difficult to leave him for more than a few days so it helps to leave behind what feels like a piece of myself. Bread is just that way.